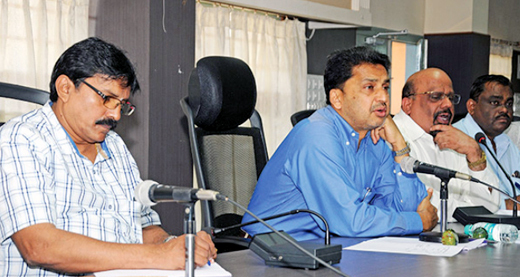 Mangalore, Sep 15, 2014: Malaria control programme meeting at the DK DC’s office on September 13, the concerned officials presented information on the malaria situation in the district and the programmes introduced to control the disease. District Malaria Officer Dr Arun Kumar said that in the new format more than 80 malaria testing laboratories in Mangalore City Corporation limits that have identified by the health department, have been submitting reports on malaria cases. However, to a query by general physician Dr Srinivas Kakkillaya, who is also the member of Malaria Control Action Committee, he said no arrangement has been made so far to ensure the hospitals to submit report on death cases due to malaria. Though nearly 15 death cases due to malaria have been reported, there is no convincing evidence to conclude the cause. Despite several measures and awareness programmes initiated to prevent malaria, the disease is on the rise in DK and surroundings. The total number of malaria cases reported in Dakshina Kannada last year was 2,800, the number of cases reported this year is 6,800. But, the officials state that the increased number of cases is also due to electronic reporting system introduced, yet doctors are sure that there is a real increase in cases of confirmed malaria. One medical doctor said that the reality must be first seen and then plan the measures. Construction sites : The increase in number of malaria cases in MCC limits taken into account, the DC directed the officials to carry out the inspection in construction sites more activily and quickly. MCC In-charge Commissioner Gokuldas Nayak who said that 272 construction sites have been identified in the city of which the officials have visited 128, mosquito breeding was found in 69 sites. Action was taken to destroy mosquito breeding in many sites and notices have been issued to five building owners. Free test kits : District Malaria Control Officer Dr Arun Kumar said that free rapid diagnostic test kits and tablets for detecting and treating malaria patients was available with the health department. Private medical practitioners and hospitals can obtain the tablets from the Malaria Control office and taluk health offices for free distribution.